It is always difficult to think about repotting when the wind is howling and it is cold. As March begins it is snowing all over the South. Even Florida is cold. Nevertheless, orchids in your greenhouse and on windowsills are responding to the increase in day length. Most of the orchids in my collection are beginning their annual growth cycle. If you do not have all of the supplies you need to repot now is the time to get your order in. There is still plenty of time depending on the orchids in your collection. Species are often more sensitive to repotting so be sure you check your reference books on any species for which you are not familiar. Phalaenopsis that have bloomed out may be getting new branches on the old inflorescence. These will flower later if you leave the inflorescence on the plant or cut it just below the old blooms. If the plant is small or you want to groom it for exhibiting next year, it is best to cut the spike and let you phalaenopsis grow new roots and leaves for next year’s flowers. Many new orchid growers are anxious to repot because there is so much discussion of the topic, but only repot when your orchid needs it. Any orchid that has been in a pot with organic medium such as bark or sphagnum will need to be repotted after two years, perhaps sooner if the bark is fine or the plant has been heavily fertilized. Most phalaenopsis sold as pot plants will be either in sphagnum or a mix that looks like garden soil. These plants were not intended to be grown after they flower, have been heavily fertilized, and some even treated with hormones. If you wish to grow these orchids and flower them again you will need to repot them after they flower. Expect a period of decline before growth as the orchid recovers from being pushed into producing lots of blooms. Each year, cold weather takes a toll on orchids when heating systems fail while the owner is on vacation or in a hospital. I have always wondered how much cold can orchids experience and still survive. This year, a number of cattleya species and hybrids were sacrificed and left outside the greenhouse to test their tolerance to cold. Some growers claim that orchids are more cold tolerant if they are kept dry, so very little water was applied to these orchids. They were maintained under a small tangerine tree in medium light and watered only when no cold weather was expected. Phalaenopsis succumbed to rots once night temperatures dropped into the low 50s F. Cattleya hybrids generally began to show stress when low temperatures were in the mid 40s F. Stress included leaves turning black or black spots on green leaves. All but one hybrid died when temperatures were in the mid 30s F. The hybrid that survived the longest and even put out new roots right to the end was Lc Molly Tyler, which has C bowringiana prominent in the background. 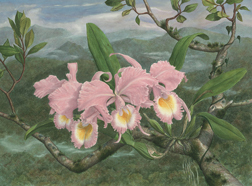 Cattleya species died at around the same temperature as hybrids with one exception, Laelia purpurata. This species experiences cold temperatures along Brazil’s south Atlantic coast in winter, and so might be expected to tolerate cold weather. On several occasions, night temperatures were near freezing and the single L purpurata in the experiment seemed unaffected. Finally, night temperature reached 28 F on the bench, which seemed to be too extreme for even this cold hardy orchid. It showed leaf damage similar to what was observed for hybrids earlier. Some pseudobulbs remained green as did the rhizome itself. Curiosity and respect for the tenacity of this plant led me to put it back in the greenhouse a few weeks after the severe cold just to see if it could still be alive. Three weeks after enduring a low temperature of 28 F, it began to grow new roots. Clearly, some orchids are far tougher than we give them credit for.